Day 5 . . . I woke up in the middle of the old south. The crummy bed creaked and groaned as I got up. I grabbed the pitcher. The door squeaked as I cracked it open and peeked outside. The old hotel was quiet. All its patrons, the few that it had, had either left or were comatose from the previous night’s workout. I snuck down to the public restroom and did my business, filled up the pitcher and snuck back to the room. Pulling toothpaste and soap from my backpack, I washed up, and then carried the bowl back to the restroom to dump it. I packed myself up, and walked quietly out. The crusty codger was asleep in his chair behind the desk, as if he had never left. Stepping out of the building, there, a half block away, was the squad car, the slightly hefty, gruff Sheriff Taylor mimic behind the wheel. I walked across the street and snapped a shot of the hotel, and then headed toward the convenience store a few blocks away. Some chocolate milk and some peanuts made a breakfast. When I stepped outside, again a half block away was the black and white, dogging me. This little burg was not a friendly place, at least not to me. Looking up and down the street, a sign caught my eye. “Greyhound.” That would be the quickest way out from under the Romulan’s gaze. I headed toward the refuge. Well, that was a lot less than expected. I purchased the ticket, and made myself comfortable in the waiting room as the ride wouldn’t begin for almost two hours. At times I would get up to stretch my legs and walk outside. No sign of the cop. I guess seeing me walk into the bus station he felt comfortable that I was on my way out of his version of Mayberry. The bus arrived. I climbed aboard with three or so other folk. As the bus was nearly empty, and getting uncomfortable vibes from the other passengers, I took the back bench, which I had all to myself, so I could stretch out for the ride. If you pull up Google Earth and look up Monks Corner, SC, you will be shown a store in the center of the state. Monks Corner in 1974 was a small hamlet a few miles outside of Summerville. Summerville has since grown and annexed the little village, absorbing it out of existence. 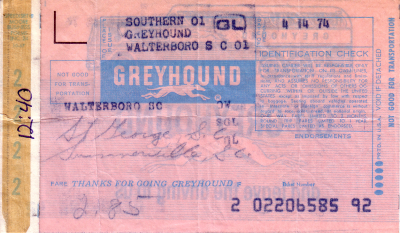 You may also notice that St. George is north of both Walterboro and Summerville. That was the way the bus ran, using the major interstates, I-95 north to I-26 east. A rather ‘round about approach, especially as St. George was closer to home than Summerville. But what the heck, I had set a target. When the bus arrived in St. George, all of the passengers disembarked. The driver told me he was going to get a quick lunch and asked if I wanted to come along. I told him I was fine. He said he would be back in about 30 minutes, so I sat in the bus, occasionally stepping outside to stretch my legs. While sitting in the bus, on the last seat, I noticed a little sign over the back window. It read, “Emergency Exit.” It indicated the breakaway window and door section of the rear of the bus; to be used incase of some accident. It struck me as suddenly as a slap. That was what this whole quest was all about. We all read those wonderful stories of daring do, and fantasize about amazing adventures. We hope that we may someday do those astonishing things. That we can really live life. That is what we think it is all about, what life is. But it isn’t. Life is about the boring and droll. It is about jobs and sleep. Endless days leading into endless days. That is what life really is. Ants doing the same thing today they have done for countless millennia before, because that is what keeps the hive alive. The fancy tales are escapes from the reality of life itself. This was my own fancy tale. My escape. This whole quest was my Emergency Exit from the dreaded and looming normality of life. It had been close to half an hour. The driver was due back at any moment. I noticed that one of the corners of the reflective Emergency Exit sticker was raised. I kneeled on the rear bench and grabbed the loose corner and gave a little tug. The peel and stick banner pulled easily away from the glossy metal surface. I removed the entire sticker and quickly placed it on my backpack, and then turned the backpack around. Only a few minutes later the bus driver returned, and off to Summerville we went.